What do you think of the weather? Warm breeze, rain. I went out to give my presentation this afternoon. 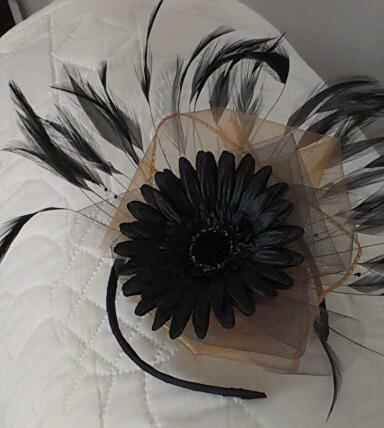 I wore my favorite facinator. But the wind mussed up my feathers. I've got a lot of use out of it recently. Maybe it's time for a new one. If you are free, why not come to the Stepping Stones Seniors Center at 2 o'clock. I'm giving a presentation to the crafters' group and visitors that is called "Not Quite Quilting". The presentation is a story about how doing crafty things with my grand children has lead me in different directions from quilting. If you local, why not drop in to the center for 2 pm. There will be tea and cookies after. 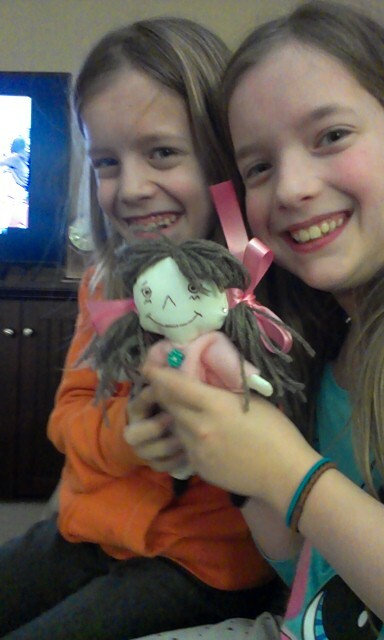 After school, I had a visit today from Grace and Caitlin. I happened to be using up some left-over royal icing in the freezer, so I got them to help me decorate some sugar cookies. These girls are old pros at decorating cookies. Garbage... Now the fun begins. 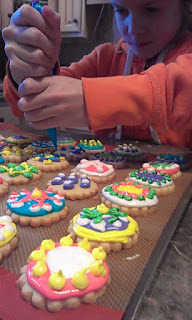 What can you do with icing, before it gets tossed?. 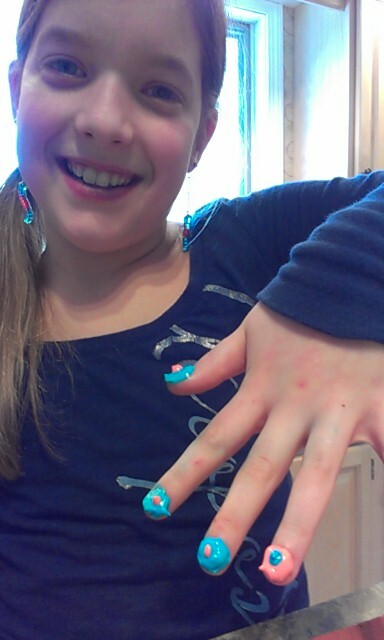 First Caitlin was showing me what a party finger is. It's when you put royal icing on all your fingernails, but one is different!!! And finally, just seconds before the bags of icing gets thrown in the garbage, they take a bunch of colors and squeeze 3 seconds of icing into their mouths!!!! 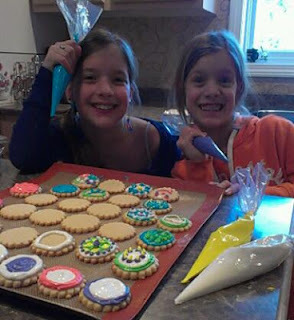 What do you think, is it more fun to ice cookies, or ice yourself!! The Cotton Mill Quilter's Guild sponsored this great I Spy wall quilt for the new K - 5 school that just opened up after Christmas. 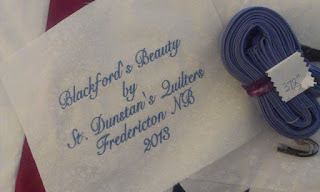 While the I spy fabrics were donated by mostly members, a few of my friends were helpful in getting me some special pieces of fabric that are important about New Brunswick. Shirley R. for great potato, lady slipper, and the Hartland Bridge fabric. Linda H. for the violets, and Lee M. for the blueberries. 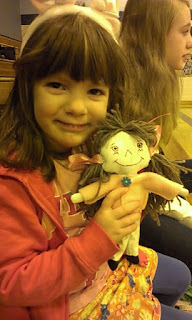 We had a work party last week in Joan B. 's new and fabulous studio. We made great headway but none of us knew how long it would take. It would take that much effort again but at the point we left it. We decided it was best left to one person to put it all together. I volunteered. While still in pieces, but all the layout was done, I took it to guild this past Monday. We needed the members put a fresh eagle eye to it to make sure that not too many of the same colors were too close to one another. I know I was just cross-eyed from looking at it too much. They did a good job. It looks great. After the guild day, I started to sew the rows together on Wednesday. I paced myself by setting a daily quota. I wanted it done by today, Sunday. A day of rest!! Now, it will go to co-coordinator, Gwenda who will quilt it on her long arm. I have the multi-colored binding ready to apply whenever it's ready from Gwenda. I won't show too much detail right now. 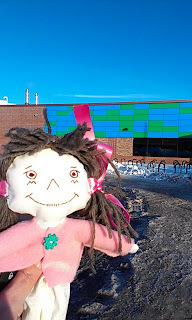 It will be unveiled at the school's official opening in a month or so. But I will tell you that it's long. It's 124" long by 40" high. With around 300 "I Spy" hexagons, it's perfect for the long hallway that the little kids pass through on their way in and out of the school. Stay tuned. I will show you pictures in detail when it's hung in it's new home later on. I've completed another row on the Cotton Mill Guild's Row of the Month project. Its the peppermint candies. There are 6 peppermints appliqued to a background strip. 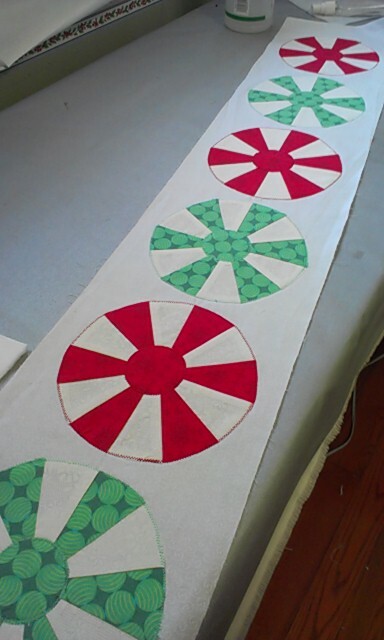 Actually, the instructions for the peppermints are only being given out at tomorrow's Guild meeting. But being guild coordinator has benefits. I got the directions early. Now, my next step is to make the four sashing rows, a small border and voila, the top is done. I will machine quilt this myself, but probably not until I return from snow-birding in Florida. If you are interested in the pattern, the source is listed on the Cotton Mill Quilt Guild blog post here. As you probably know by now, in addition to making quilts, I like to make all kinds of small projects. I think you'll like my latest creation. For years I had a little coin purse smaller than this one. I used to keep my American money in it. My old colleague Julie and I used to do a bit of shopping whenever we went on business travel to the USA. She used to make fun of me with my little purse, but it was perfect for carrying my wad of bills and coins. A few years ago, while snow-birding in the USA, I lost it. I was sick about it. I had that little coin purse for about 10 years or more!! I looked everywhere. 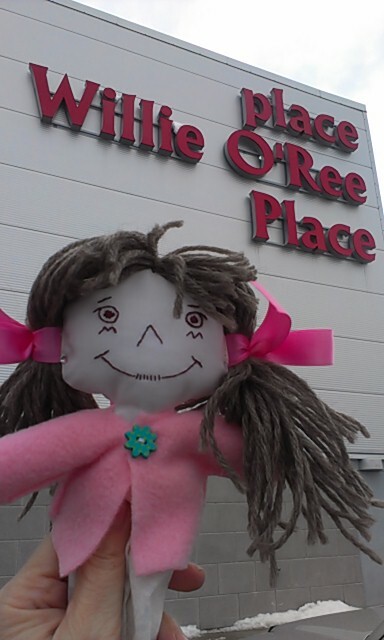 Twice, I traced my steps at the outlet mall asking store employees if anyone had found it and turned it in. No luck. Well, you guessed it, I made one. 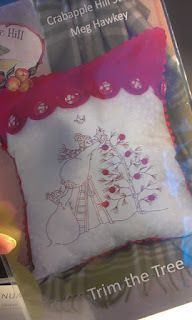 It's made using a purchased frame. It's about 4.5" wide and it opens quite wide. The fabric, lining, batting were gifts to my stash from my Friday Girlfriends. (No, you can't have it back :) I have a sizable silk ribbon stash, so I thought how nice ribbon would be when applied to this woven fabric. Isn't it cute! 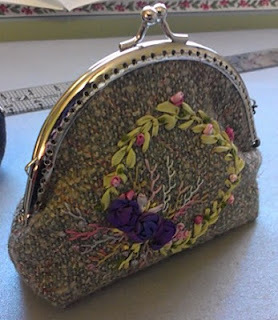 Unless you buy a purse frame in a kit, you don't get a pattern to make the purse. I didn't realize this when I bought my frame, so I had to make a pattern to fit the frame. That was a bit of a tricky process, but after a bit of trial and error, I think I can do it now for any size and shape of frame. I purchased a pattern online for a different style of coin purse but for a similar style frame, so I'm anxious to try that pattern. I'll show it to you next week when I get it done. 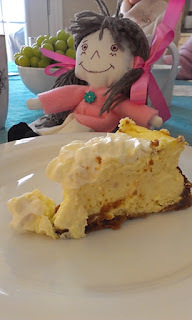 By your popular request, Jenny has kindly shared her cheesecake recipe that Cindy and I enjoyed last Friday. Preheat oven to 350 F if using a silver 9-inch spring form pan (or to 325 F if using a dark nonstick pan). 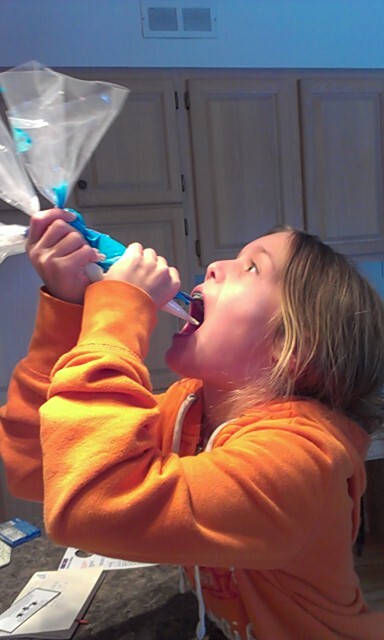 Mix crumbs, ¼ cup of the sugar and the butter. Reserve ½ cup of the crumb mixture; press remaining crumb mixture firmly onto the bottom of the pan. I used all the crumb mixture for the base and didn’t save any to sprinkle on the top. Set aside. Beat the cream cheese and remaining 1cup sugar in a large bowl with an electric mixer on medium speed until well blended. Add sour cream, lemon peel and juice; mix well. Add eggs, one at a time, beating on low speed after each addition just until blended. Pour over crust; sprinkle with reserved crumb mixture. Bake for 45 – 50 minutes or until the centre is almost set. Turn off oven. Open door slightly and let cheesecake stand in oven for 30 minutes. Remove to a wire rack. Run knife or metal spatula around rim of pan to loosen cake; cool before removing rim of pan. Refrigerate at least 4 hours or overnight. Garnish as desired. Caitlin and Grace pick their Quilts out. Caitlin and Grace where here a few days ago. We were on a mission. It's time they had big girl quilts. We looked through tons of books, and guess what. The girls picked out the same quilt. 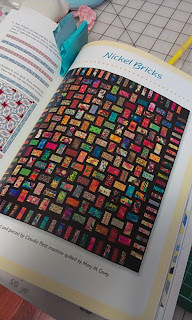 It's called Nickel Bricks from the Loose Change book. We wrestled with that same quilt idea all evening. 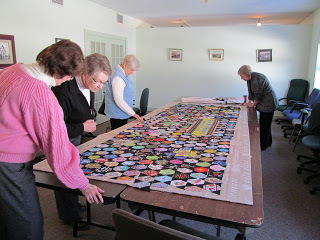 Eventually, we came to the conclusion that while the quilts will be the same pattern, they will definitely be different quilts. 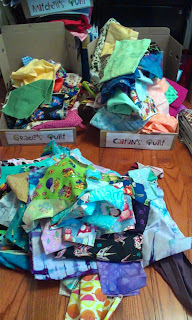 Each of the girls picked through my stash for their quilt. Then there is a pile of fabrics that they both loved so those fabrics will be put into both quilts. I will have fun now, as I cut kits. These might be the kits that come snowbirding with us next month. A box for each of the kits. Cutting strips is in my work plan this week. I'm glad she's going to Saint John tomorrow. She's tiring me out. Here is our adventures today. Our healthy walk again... No donut this time. Grammie and Cindy had a busy day. Tomorrow will be a fun day too. early this morning. It was barely daylight. She enjoyed her healthy walk. Whew, she needed a donut after that. Cindy thought this was the biggest church ever. 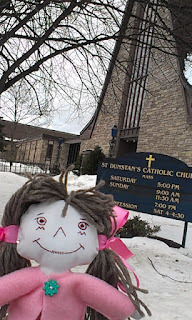 We went to visit with the St. Dunstan's Quilters. Aurora gave her a name last week when she was here. 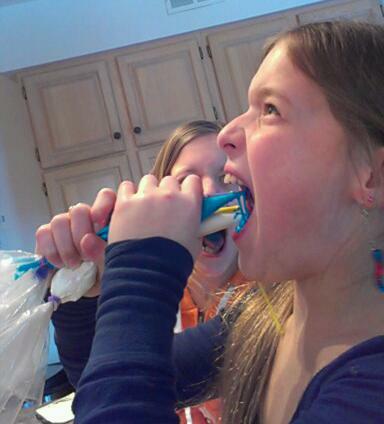 She helped to put stuffing in her body and head last weekend. 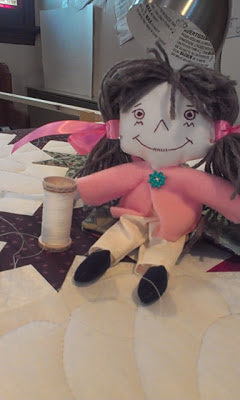 After we sewed on her legs and arms, Aurora wanted her to have some clothes, pigtails and ribbons for her hair. 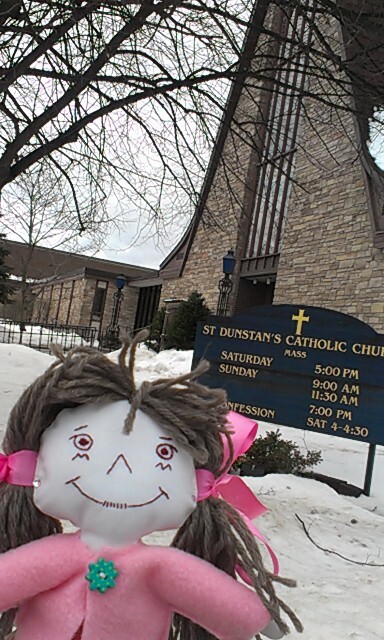 Decked out in her new duds, I took Cindy to quilting at the church this afternoon. She enjoyed her afternoon as the quilters oogled her new diamond earrings. Cindy is patiently sitting on the kitchen table, waiting for her supper now. I wonder where else she'll turn up this week before heading to her permanent home in Saint John this weekend. It's folded over my railing so that I won't have to iron it again before delivery. It still is months away from being totally done and when I see it again, it won't look the same at all. 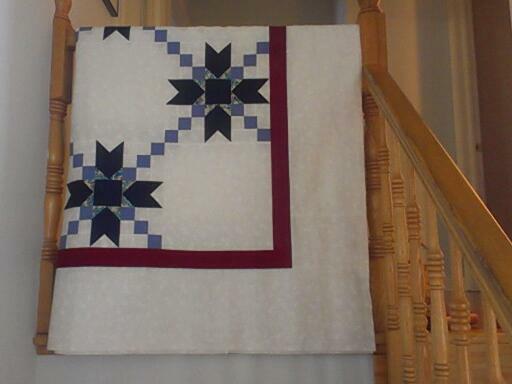 Hand quilting just adds such a elegance to a traditional quilt. There's nothing like it. It's Friday. I normally go to coffee on Friday mornings with the Friday Girls. 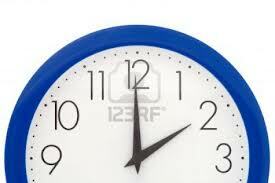 But school is still out, and our first coffee break of the new year is not until next Friday! So, what would I do with my morning? 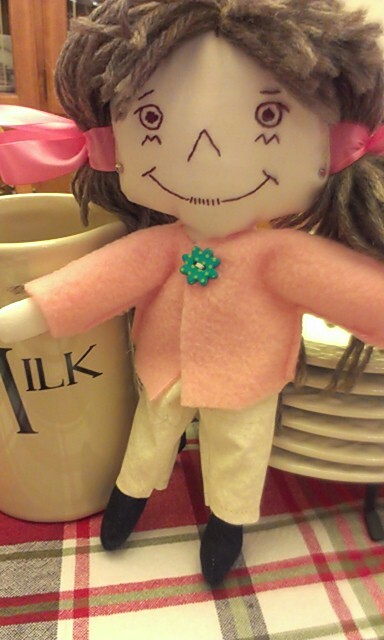 I made a little rag doll. I hand stitched her face before I cut her out and sewed her up. It's sort of a test to see if it might be a good project for my kiddos sometime. This little one is only about 9 inches and I love her skinny little legs and arms. She's not done, but I realize now that it's too small. 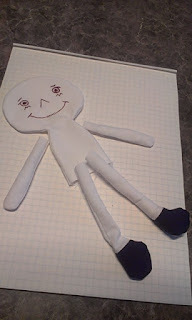 I can hardly stuff the arms and legs. And I know the kids will never be able to stuff her. 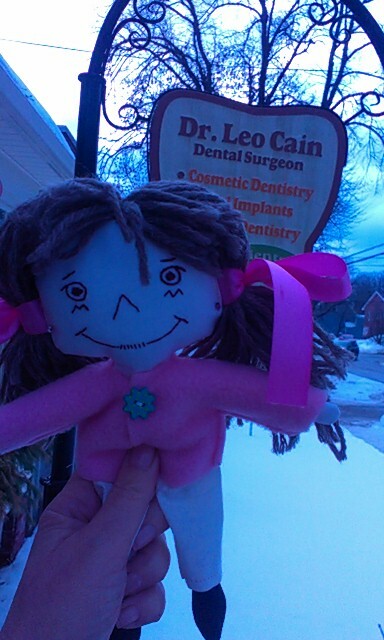 I know that I'll have to find a larger rag doll for the kids. I'll finish stitching up this little doll, give her some hair, make a little dress and give her a name. I'll show this little one to you again when she's done. 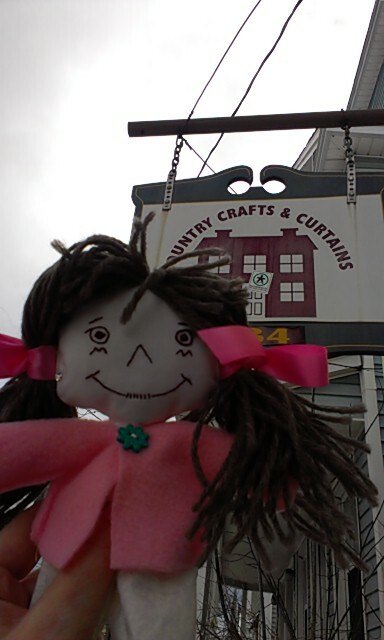 I just got back from Country Crafts and Curtains downtown. It was nice to have a little fun chit chat about crafts with Diane. But I have to tell you, it's like Christmas in there. Lots of new stock and I just fell in love with this "Trim the Tree" stitching pattern. I can't wait to trace it off later this afternoon. I might even start working on it this evening. 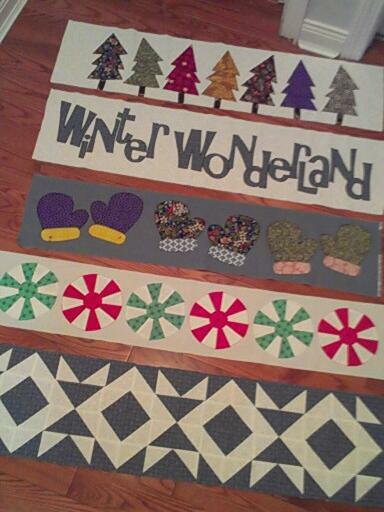 For a long time, I've had two quilts on my to-do list that require templates. They are the Winding Ways quilt and a Storm at Sea quilt. Monica W. from our guild will be leading a Storm at Sea class in April, and I'll be the first to sign up for that one. 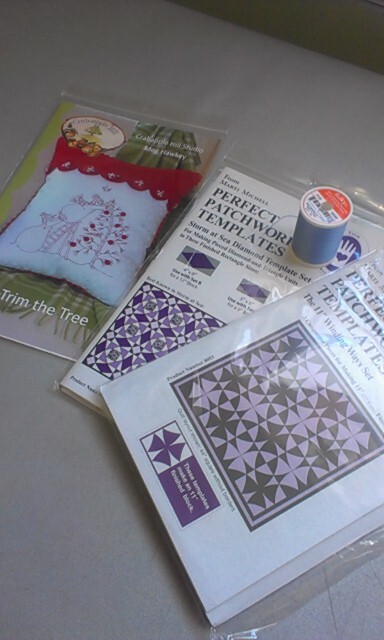 Got my templates, got lots of fabric, now I will have to hold myself back from doing it. I'll play with the Winding Ways templates to see how easy or hard they are to use. And finally, a blue spool of thread, it's Sulky 12 weight. Exactly what I love to do hand embroidery. She also has a fresh supply of Sulky Christmas Red if you've been looking for some.